Vandaag ga ik mijn Astro-nagels voorstellen, met weer een stap voor stap uitleg. Deze nagels droeg ik wanneer met een vriendin ging shoppen voor haar verjaardag. 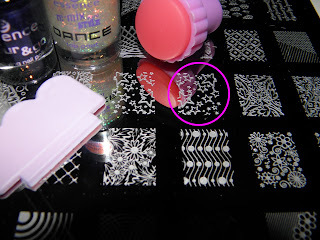 Today I'm going to introduce you my Astro-nails, again with a step by step tutorial. I have wearn these nails when I went shopping with a friend for her birthday. Lak je nagels met essence colour & go : 76 Hard to resist. Dit geeft je nagels een blauwe kleur met glans. Polish your nails with essence colour & go : 76 Hard to resist. This will give your nails a blue colour with a shine in it. Stempel met gebruik van stempel, scraper, dashica big image plate SdP B en Sinful colors : Snow me white, een sterretjes patroon op je nagels. Je kan de richting en plaatsing zelf bepalen, willekeurig vind ik het mooiste. Stamp with use of stamp, scraper, dashica big image plate SdP B and Sinfull colors : Snow me white, a star pattern on your nails. You can decide the direction and placement by yourself, random I think is the best. Eindig je creatie met de topcoat van Essence re-mix your style Dance, dit creëert een speciaal effect. Finish your design with the topcoat from Essence re-mix your style Dance, this creates a special effect. Een dikke +1 voor jullie op google!